Version of Castelo de Vide, collected and published by António Franco Infante (Infante, 1985: 136). Our Lady appeared to a little shepherd at the place where the chapel is located [Vale de Açor, Ponte de Sor] and told him to go to Castelo de Vide to ask the farmers to build a chapel there. So they did, choosing for the oracle of this chapel Our Lady of Pleasures. Later, due to great drought, the farmers of Castelo de Vide promised annually to celebrate in honor of Our Lady of Pleasures, if it would give them the grace of the rain necessary for their fields. Grace was granted, raining abundantly. And from then until today, the farmers of Castelo de Vide there go to the Bridge of Sor to festively worship Our Lady of Pleasures [...]. Version of Castelo de Vide, collected and published by Maria Guadalupe Transmontano Alexandre (Alexandre, 1987: 476 - 477).Walking a little black shepherd with his flock by the Homestead of Alparrajão appeared to him to Our Lady that asked him the following one:"You should come to Castelo de Vide to tell the farmers to build a chapel in the place where they would celebrate a feast in His honor on September 8 of each year. "Faced with the embarrassment of the young black man who was not aware of the land where he should go, he explained to the Virgin that she "walked until she met many men together." And so it came.He did not succeed in persuading the recipients of the message and went back to the herd. Our Lady appeared again and after hearing the little shepherd sent him a second time to this village. And still the unbelief was the answer obtained by the poor wanderer. He returned and for the third time he saw the Virgin who promised him a miracle:"Tell them that what you pass on them is as true as the fact will become in their sight white. "And the humble messenger went to Castelo de Vide and spoke to the farmers. The miracle worked, and objections ceased before him. They mounted on horseback and went to the Homestead of Alparrajão, bringing an Image that they found for the Church of Santiago of their land.It is said that the horses ran and they did not see them dripping with sweat. But the request was not satisfied. And so the next day the Image disappeared from the village.They then built the chapel in the Homestead and began to celebrate the feast that still stands today. Ponte de Sor version, collected by Primo Pedro da Conceição Freire Andrade and quoted by Maria Guadalupe Alexandre (Alexandre, 1987: 478). [...] Our Lady appeared once inside a burrow of a holm oak. A shepherd of Castelo de Vide, who pastured his flock there, found the image and took it one day to the Church of his land. 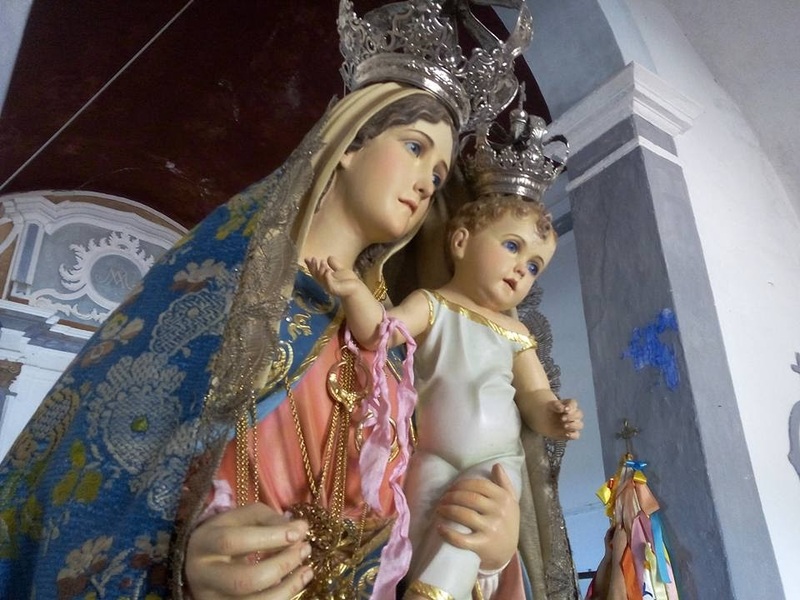 Some time later, Our Lady returned to the place of the first apparition. Again the shepherd found her and brought her back. 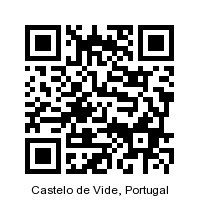 And how many times the Lady was taken to Castelo de Vide, how many times did she appear there again. Then ... the people had a church built on the site, whose main altar is in the place of the own holm oak, which for that purpose was sawn. […] Nossa Senhora apareceu uma vez dentro de uma toca de uma azinheira. Um pastor de Castelo de Vide, que apascentava o seu rebanho por ali, encontrou a imagem e levou-a, um dia, para a Igreja da sua terra. Tempos depois, Nossa Senhora voltou ao local da primeira aparição. Novamente o pastor a encontrou e voltou a levá-la. E quantas vezes a Senhora foi levada para Castelo de Vide, quantas vezes voltou a aparecer ali. 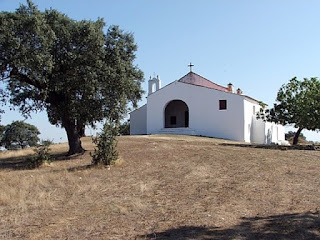 Então, […] o povo mandou construir no local uma Igreja, cujo altar-mor é no sítio da própria azinheira, que para o efeito foi serrada.